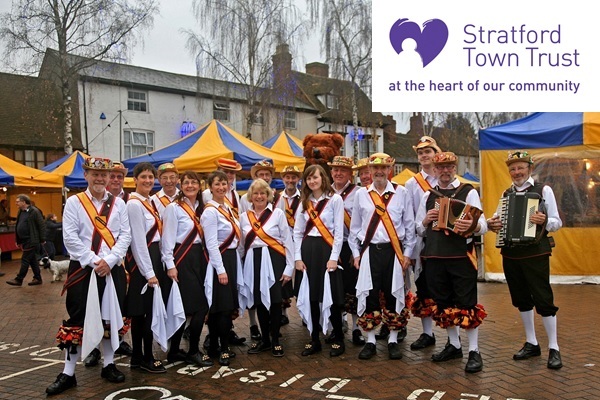 Shakespeare Morris was founded in 1959 and is "The Keeper of the Bidford-on-Avon Tradition." The Shakespeare Morris Men have a special connection with the nearby village of Bidford-on-Avon, whose morris tradition has been extensively researched since 1965 by Phillip Taylor, SMM's long suffering musician for many years, assisted by Tony Parsons, the great grandson of Edwin Salisbury, the foreman of the 1886 Shakespearean Bidford Morris Dancers. We also dance a variety of Cotswold Morris traditions collected from other local villages such as Adderbury, Bampton, Bucknell, Lichfield and Stanton Harcourt. We have recently formed a Ladies Team who also dance Cotswold Morris including the Bidford Tradition. Shakespeare Morris has the priviledge of wearing the family Coat of Arms of the house of John Shakespeare, William Shakespeare's father, by kind permission of the Shakespeare Trust. The gold & black shield familar to visitors to Stratford which shows a 'shake spear' or in historic terms, a left leaning spear. Shakespeare's Birthday celebrations in Stratford continue to be a key date in our calendar, as do the opening of Stratford's Mop Fair, Christmas Lights Turn-ons in Stratford-upon-Avon and nearby Bidford-on-Avon, and our May Day Celebrations. We practice in Stratford weekly (see 'Practice') and during the Summer months we Dance and in Winter months perform Mummers' plays (see 'Mumming') out in local villages, sometimes with other local morris teams. We also make regular appearances on the Bancroft Gardens in Stratford where we enjoy introducing visitors to English Traditions. In 2017 we stand at 30 active members, who either dance, play music or perform our mummers' plays. We are a very friendly bunch who always welcome new members to contribute to the success of our club. In addition to our local performances we enjoy travelling to events across the country, Saddleworth Rushcart is a regular event as are performances in London. We have in the recent past travelled to Helmond in the Netherlands to take part in Morris events there. Sampling our finest local Inns and Public Houses is usually closely linked with our danceouts during the summer months and we have close ties with the Stratford branch of CAMRA. Each year we hold a lunch on Shakespeare's Birthday, breakfast on Mayday and a Christmas Dinner where we say thank you for the support of the partners of our performers and enjoy ourselves in customary merriment.